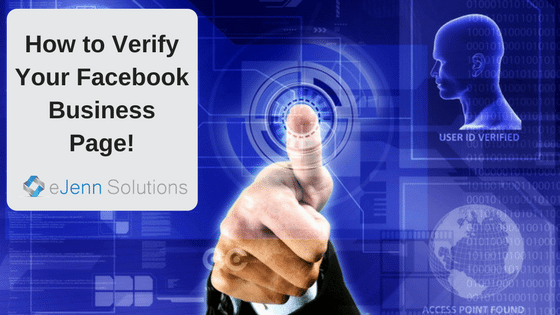 Home » How to Verify Your Business Facebook Page! If you haven’t already done this … hop to it! Verifying your Facebook Business page will allow you to rank higher in searches! It’s also going to become important for trust factors with the consumer. Along with Facebook giving pages a higher ranking with verifications … 3rd party platforms may not be able to work with pictures and particular posts on those platforms unless a page is verified. So the bottom line is – get your Facebook Business Page Verified! Relax – it’s super easy and doesn’t require finger printing! Move your cursor to right hand side of the menu bar to the word “Settings”. Click settings. Under the “General” section (should open to that section immediately after clicking settings) look for the second line item called “Page Verification”. If your page is already verified, you don’t need to do anything further. If your page is NOT verified, go to the “edit” blue link and click. Simply click the whole “page verification” section and that should open up the editing mode for you too! If your page is not verified you will have the blue “verify this page” clickable link. There are 2 ways to verify your Facebook Business Page. 1. Simply make sure that the phone number in your about section and the phone number you list here ARE THE SAME. You cannot have 1 number listed on the page and put a different number in this section. It will not work. trouble-shooting- non-approval: If the phone numbers are the same in your about section and the number you placed here for verification and you were not allowed verification. Make sure the phone number on the page is not the same number as your phone used for your personal Facebook app. You need a separate business phone number for this verification process. 2. You may upload business documents as another option for page verification. This process is longer. To Submit Forms – Click the blue link on the bottom across from “Call Me Now” to the left. Read Facebook’s document request for the correct forms to send. 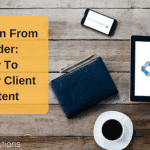 Gather requested forms and upload per Facebook’s instructions. Go back to your main home screen and view your Facebook Business name. If all went well, you’ll have a grey check by the name as you see in this photo. You should also receive a Facebook notification confirming your verification. If you don’t have a check mark … go back and do the process again. We hope this helps you stay up above your competition! 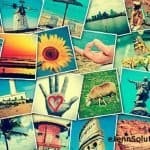 Subscribe to eJenn Solutions for more great tips for your business online marketing!